Yesterday the club heard a very powerful message from John-Michael Lander from Dayton. John-Michael was an actor on General Hospital and various other acting roles, he was a collegiate Springboard Diver (in preparation for the Olympics), he is now a current Collegiate Springboard Diving Judge, a published Author, a Ted Talk speaker and many other things. He spoke about his experiences concerning the abuses he was subjected to during his teenage and young adulthood years - AND how he is reaching out and helping young people (especially athletes) that are going through these abuses now. New Bremen Pumpkinfest Chairman Tony Eyink spoke to the club yesterday about the history on how Pumpkinfest started in 2003. He provided a recap of the 2018 event and insight on the upcoming year. Club members Lesia Arnett & Mary Williams spoke yesterday about the exciting changes and updates happening at Auglaize/Mercer Counties Family YMCA. Be sure to stop in soon and get a tour of the facilities and all they have to offer. Wildlife Officers Mark Schemmell (Auglaize County) and Brad Buening (Mercer County) spoke to the club today about the Bald Eagle population in Ohio and our surrounding counties. Our national symbol, the bald eagle displays many outstanding characteristics - exceptional vision, a striking appearance, and a commanding presence. Yesterday the club heard from Auglaize County EMA Director, Troy Anderson, who spoke about their comprehensive Emergency Management program which assists people with resources in order to protect lives, property and the environment within Auglaize County. This week's program featured club members Bernie Schroer & Joni Leffel who spoke regarding the 90th anniversary & history of New Bremen Machine & Tool. 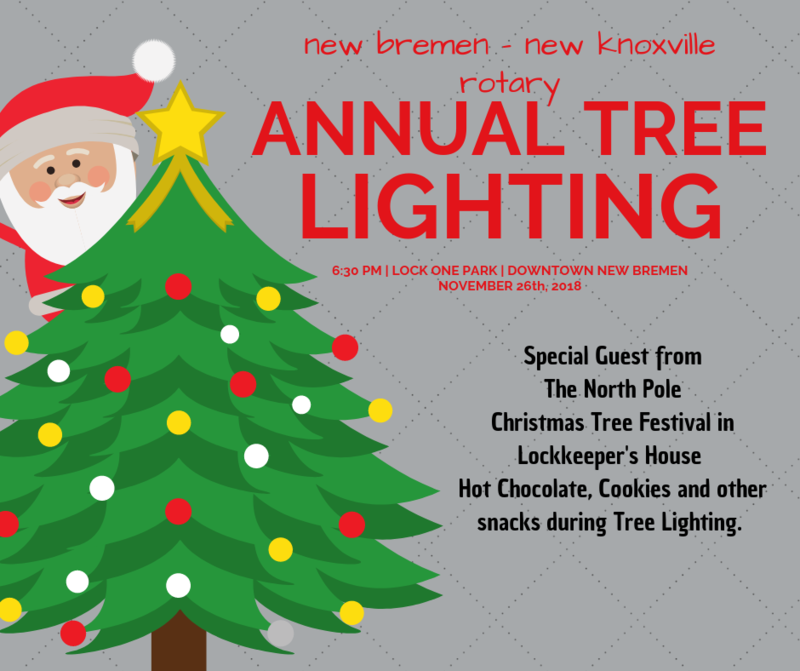 Join us for the annual Christmas Tree Lighting! Yesterday the club hosted a debate for the candidates of Ohio's 84th House District, Susan Manchester & Joe Monbeck for the 84th. We had a great turnout and learned a lot about the views of both candidates! We had a great meeting yesterday! First, the club heard from Chuck Gamble of the Aug-Mer Shrine Club. We were very excited to present Chuck with a $500 donation to the Shriners Hospital for Children to help further the great work that they do. Our second speaker for the day was Matthew Lomakin, owner of Redbird Armory in New Bremen. Matthew talked about the services that they provide, including firearms training, cleaning/maintenance, parts/accessories, and customization as well as how they plan to give back to the community. This week the club heard from LJ Jellison, Creative Director of Content at NK Telco. LJ gave an update on NK Telco, NKT TV and NKTelco Productions. Please welcome our newest club member, Mary Williams with Auglaize Mercer YMCA! District Governor Maris Brenner visited the club on Tuesday, September 18. She gave an update on District 6600 and explained how she became District Governor. Yesterday's program was Diana Russell, Director of Fund Development at Maria Stein Shrine of the Holy Relics. Diana spoke to the club about the history of the Relic Chapel, Heritage Museum, outdoor attractions and opportunities to tour the Shrine. Join us for a conference to explore the idea of peace and how we can make a difference right where we are. This event features Mohammed Eid, a Rotary Peace Scholar at the University of North Carolina, Chapel Hill. Mohammed is from the Gaza Strip, Palestine one of the most beautiful places in the world, yet also the site of some of the word conflict in the world. Mohammed will share his unique perspective related to his work and home country. Last week the club welcomed Sheriff Al Solomon and Intake Officers Lisa Wright and Jenny Mullenhour who spoke about the Jail Intake Procedures. Thanks everyone for joining us! Yesterday's program was Michael Fannon, Assistant Agent in Charge with Ohio Bureau of Workers' Compensation Special Investigations Department. Thanks for joining us! Yesterday the club hosted Congressman Jim Jordan who provided an update on Ohio's 4th Congressional District. Thanks for joining us! Last week the club had a great program by Kendra & Brian Stetler. They spoke about the benefits of CBD oil, and how it helped Kendra fight depression. Thanks for joining us and sharing your personal story! Linda Plattner stopped by the New Bremen New Knoxville Rotary on Tuesday morning to tell rotarians why she wasn't afraid to become a flight attendant right after 9/11. Hello to everyone from Farming Hope. Your club, and you as individual members, more than anyone else, have made our biggest project yet possible. In sunny El Salvador, short weeks ago, two acres went up for sale next to our farm for homeless individuals. I barely had to ask and your club, quite quickly, acted to make that purchase. I am personally so grateful for the chance to speak to your club, and now work together to double a working solution, and be part of your wishes and work for a better world. Your investment protects and grows a future for many hungry and homeless individuals, for generations. Thanks to you, our farm will be more than double in size, now over three acres, allowing us to grow twice as much corn, beans, vegetables to eat at the Hope House homeless shelter (feeding 50+ daily) and twice the work spots for homeless individuals to rebuild their lives on the farm. This pilot farm is a model for farms in Wisconsin, Illinois, and now California (and someday, Ohio!). The lessons from El Salvador are an investment in better, more sustainable charity, the kind Rotary promotes, the kind our communities need. Thank you immensely for investing in your brothers and sisters in El Salvador, and in a project that can grow to inspire sustainable farming projects worldwide. A special note: I want to invite you to see the fruits of your loving investment: winter harvest season is October-December, and I'd love you to visit next year to see the newly improved farm and volunteer side-by-side with the Hope Farmers. Thanks - and good luck in all your endeavors. God Bless. Just a reminder to all members and guests that we won't have meetings on December 22 or December 29. If you signed up to donate a baked item to the Cardinal Pride event, please remember that it's this Friday. The New Bremen High School choir will be at our meeting on December 15th. We look forward to this yearly celebration that helps get us all in the spirit of Christmas! Because numerous members and guests cannot make the auction this fall, the committee has decided to postpone it until next spring. March 12th is the date that has been chosen so mark it down and plan to attend, have some fun and support our club, communities and the projects that we sponsor and support!